All of us at Feed to Succeed provide a wide range of nutrition services for children of all ages, including assessment, developing care plans, monitoring and education. We know that essential to every person, especially a growing child, is healthy nutrition. This is especially true for children with special health needs. We help every child reach his or her potential by ensuring he/she is getting proper nutrition in order to grow and thrive. We work closely with other health care professionals to share knowledge and expertise to serve you better. We also work closely with partners, like Early Intervention and pediatric practices, to achieve long-term solutions to specific health and nutrition challenges. Each of us at Feed to Succeed are experts in all areas of pediatric nutrition, and individually specialize in specific areas. Once we speak with you about your child, we will determine the best dietitian to work with your family. All of us are experienced at working with children of all ages and we take great pride in helping children thrive. We meet with children and parents in our beautiful office in Glenview or in the privacy of their own home. At each appointment, your child can expect to get weighed and measured to track his or her growth, and then we will meet with you and your child to discuss progress, concerns and goals. Because we understand that every child and family has different needs, we take into account both your child’s individual health and nutrition needs, as well as your family’s culture and lifestyle. We work closely with you and your child to ensure that you both understand how to meet the practical goals we develop together. All of our meetings include a full nutrition and growth assessment, diet analysis, professional recommendations, meal plans, educational materials and more. Additional fees apply for home visits. 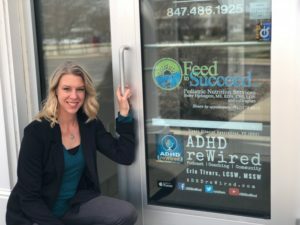 Feed to Succeed, LLC is here to serve all Chicagoland. We are based in Glenview and see patients in our beautiful, new office as well as in your own home. Our regular travel fee covers house calls in the Northshore, near northwest suburbs, and north Chicago, including: Glenview, Deerfield, Skokie, Buffalo Grove, Arlington Heights, Morton Grove, Wilmette, Evanston, Niles, Highland Park, Glencoe and other nearby Chicago suburbs. We are also available to travel to areas outside this service area for an additional travel fee.